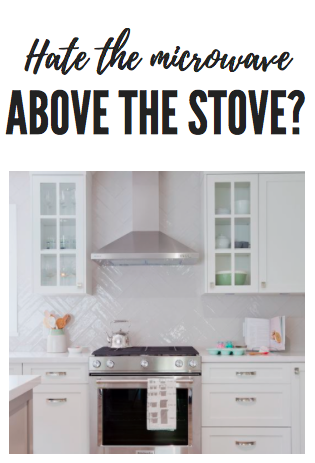 Maybe you’ve noticed (if you’ve been looking at kitchens) that lately we are seeing many, many gorgeous hood vents in lieu of microwaves mounted over ranges. That’s good news to me, and many others who much prefer not having a microwave mounted over the stove. I have lots of reasons for not liking it – based on pure aesthetics, which one looks better? Maybe some people really DO like the look of micro over the range, but I think the reality is more along the lines of not wanting to use countertop space for it, so that's where it ends up. Plus, everyone else is (was) doing it, so no one thought otherwise. If you have a small kitchen and that's what you've got and you don't have other options, so be it! BUT...maybe there's another spot for it. Maybe? Here are the cons of having the microwave over the stove: it’s not fun to lift hot and/or heavy dishes of food high up, microwaves are notorious for not having great exhaust systems, it’s very difficult for someone to cook and someone to use the microwave at the same time, and aesthetically, a hood just looks awesome. I’ve been lucky enough to NOT have a microwave mounted about my range the whole time I’ve been a homeowner, and so I want to share with you how I solved the dilemma of where to put the microwave, in both my own house and in the house of a client where we did a small kitchen renovation. Both projects turned out wonderfully, and it’s great to realize that there are other options! OK, so here’s the ‘before’ photo of a client that wanted to free up counterspace as well as create additional storage in their kitchen. They wanted to replace their countertops, too, which was good because they needed to with what I wanted to do. They love to cook and we wanted to make the kitchen as functional as possible, within the limitations. Enlarging the kitchen was not an option, because on one side was the doorway to a small hall leading to a front door, a half bath, and a sitting room (you can see it on the below pic) and on the other was an office, so there was nowhere to expand to. Also, they had vintage, gorgeous upper cabinets (pre-dating microwaves) over their stovetop anyway, so the idea of mounting it there wasn’t an option either. Now, in my kitchen, I did an undercabinet shelf, kind of similar to the next photo, except my shelf is open on all sides (below). I like both of these, they get the microwave off the counter, yet it’s not showcased either. Plus? All these examples of shelf or cabinet mounting have microwaves on the smaller side, as opposed to ones over the stove which, by default, have to be bigger. I think that’s a bonus! Is your preference – over the stove, or elsewhere? I’d love to hear! Also, are you dreaming up any home design/decorating projects? There is SO MUCH info and products out there. Maybe you're overwhelmed trying to find the best option. Maybe you don't know how to pull it all together. Maybe you can envision what you want, but are frustrated at spending time and money and it STILL not looking like you hoped. I can help - check out the more info button below and read more, or click the questionnaire info to tell me more about your project!